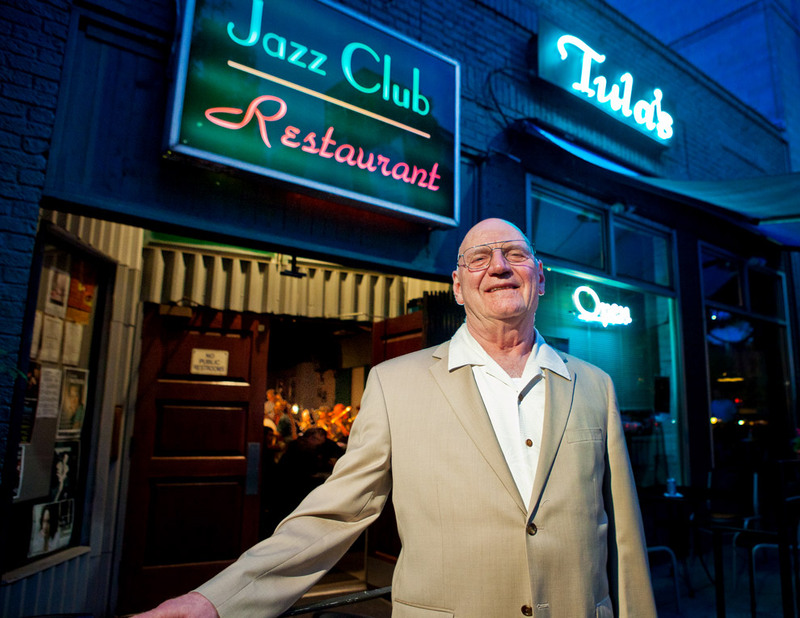 Tula’s Restaurant and Jazz Club owner Mack Waldron poses in front of the Club on the east side of Second Avenue, between Blanchard and Bell St. Tula’s presents the best of the local jazz scene 6 nights a week. Mack was a pleasure to photograph a few days ago. He has a constant twinkle in his eyes and was happy to tell the story of how he came to open Tula’s after his stint in the U.S.Navy. From an old piece from Earshot Jazz Magazine: “It should be immediately noted that the austere rock-of-a-man behind the sprawling, green bar is one Elliot “Mack” Waldron, Tula’s owner and chief bartender. A native Texan, Mack is a veteran jazzman with 26 years experience in Navy bands as a player and bandleader. In the service he was considered a players’ bandleader. Today he’s considered a players’ club owner” Continue reading here. This entry was posted on Monday, July 25th, 2011 at 1:05 pm	and is filed under FACES and tagged with Jazz Photographer, Seattle Photographers. You can follow any responses to this entry through the RSS 2.0 feed. Dear Mac—We just came back from Tula’s and hearing Emerald City Big Band. Made a reservation, but were told the seats we requested were taken. We sat in the back and listened to a high school band for an hour and a half (which was unexpected, but a good thing). When they finished, a lot of tables emptied, so we asked if we could move to a front table that was unoccupied. The hostess said that that was not the rule and I should “back off”. The bartender said we could have the table afterall. I asked for the hostess’ name to perhaps complain about her attitude, but Sheryl said we should just leave. We love Tula’s and all that you’ve done for jazz in Seattle!!! We miss Michael and the atmosphere that was so welcoming…. The manager, Sheryl, said we should just leave (there was another set just starting). We’ve never been asked to leave a jazz club(or any other establishment, for that matter).